I am creating a new event. adding the image to it by using CKEditor. when I tried to browse images/ upload the image. The error is coming. Please refer to the screenshot for the error. I followed the previous question regarding this KCFinder. I applied the available patch that is for civi 4.6. That one also didn't work. 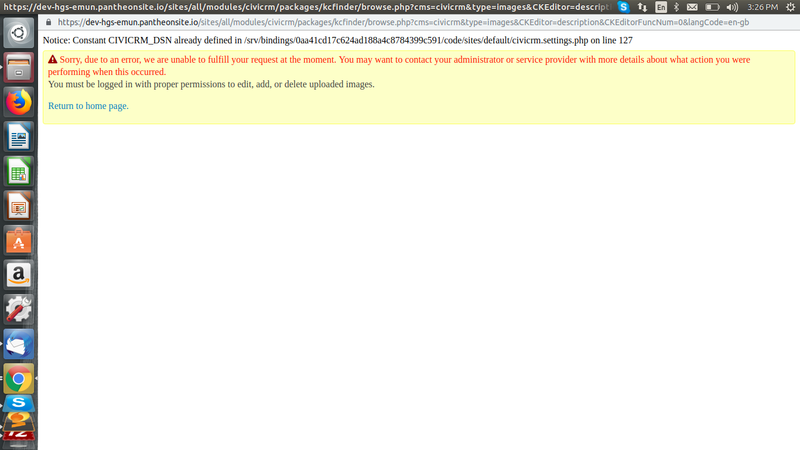 I checked file permission and drupal uploading file permission. It is fine. Please give suggestion how to solve this issue. It looks like you have two civicrm.settings.php files - or at least that CIVICRM_DSN is already defined. If you remove the extra civicrm.settings.php this problem should resolve itself. Not the answer you're looking for? Browse other questions tagged civievent drupal images kcfinder upload or ask your own question.